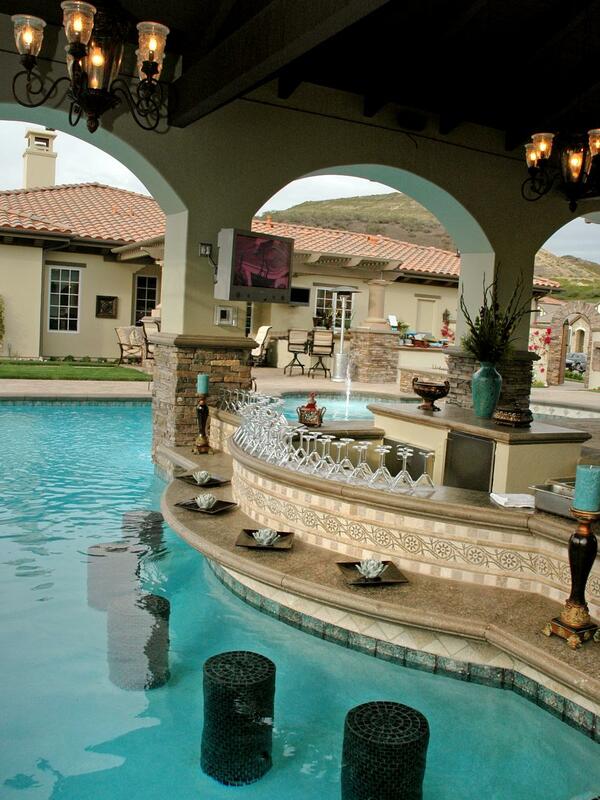 Inspiring patio designs and patios for your backyard pool party. Discover beautiful patio designs from outdoor kitchens, terraces, lighting and outdoor furniture. As the weather warms up, you're going to want to take your entertaining outdoors. While friends, food and your favorite beverages are fun inside your home, getting out into the open brings an entirely new element to parties and get-togethers. Especially, when you have a pool. That's why putting some strategic thought into your backyard and patio design is important. 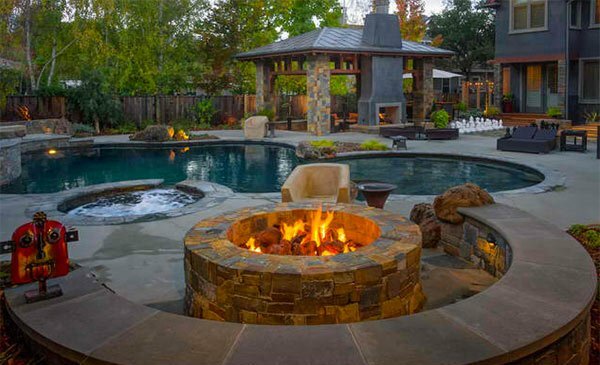 If you're looking to design a backyard fit for a pool party, the options are endless. Let's take a look at several elements of pool patio design that are ideal for hosting guests outdoors. With your family and friends poolside, you won't want to be inside the house chained to the stove and missing the conversation. Consider adding an outdoor kitchen to your patio. That way you won't miss a thing while you're grilling burgers or tossing up a salad. This outdoor kitchen design comes complete with sink, upscale grill and wine fridge, showing how this outdoor kitchen idea flows right into the natural stone theme of the outdoor space. No one wants to exit the pool dripping wet to grab a drink. If you have an in-ground pool, why not bring the outdoor bar right to your guests by adding stool seating and including a bar along the side? What a fun way to stay cool while enjoying appetizers or toasting with a glass of wine on a hot summer day! No one wants their guests to roast under the hot summer sun. An awning, gazebo, pergola or pavilion offers a much-needed escape from the sun's rays. It's also a good place to position extra seating and offers a less conspicuous spot to store the pool pump, pool filter or pool cleaners. Out of sight, out of mind for your party guests! Don't forget about those parties that continue into the late evening. 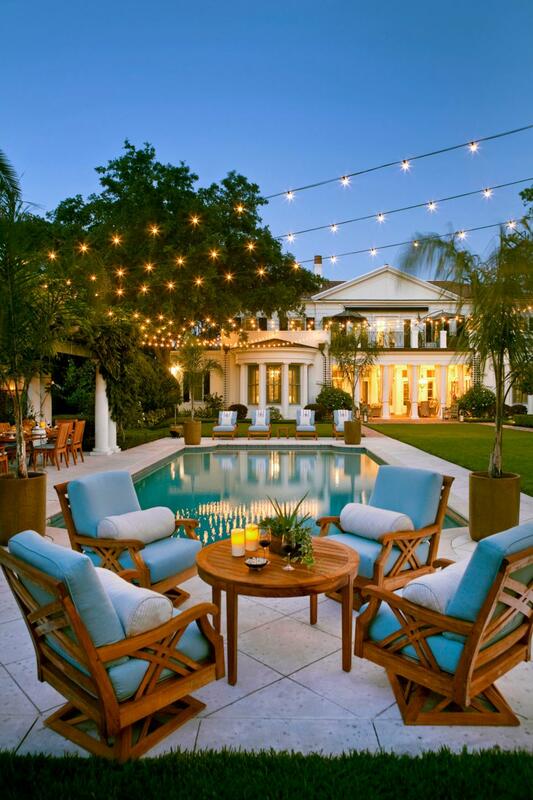 When the sun sets, you'll still need lighting for your event, so invest in some string lights or pool lighting to help illuminate your backyard and keep the party going past twilight. Maybe you're hosting a group of friends for tacos and a pitcher of margaritas. Or maybe it's a family get-together to celebrate a milestone. Whatever the occasion, it often pays off to have a real dining set on your patio. 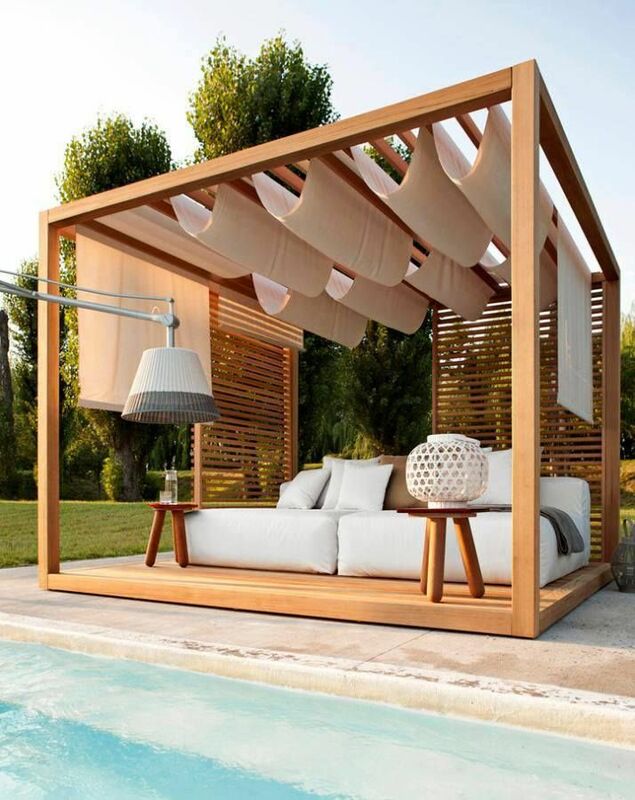 Keep a few extra chairs on hand for larger groups and make sure to provide enough shade with an umbrella or pergola. Not all nights are particularly warm, so you and your guests may want to cozy up to a fire as the lights die down. Building a fire pit with seating surrounding it makes for a romantic and relaxing atmosphere. Made of natural stone, metal or concrete, this decorative element doesn't take up much space, but offers big bang for your buck. Whether you have an inground pool or an outdoor above-ground pool, the way you design the entertainment area surrounding your pool can have a big impact on how you use it. If you want swimming lessons to be the highlight of your pool's life, a few deck chairs will suffice, but if you want to regularly host pool parties, you'll need to consider your patio design. Don't forget thoughtful lawn maintenance, either. After all, you want your space to be versatile as well as comfortable, well groomed and elegant.